Photo from Dr Prowe’s personal archive. What is the nature of your work? I am a Postdoc (i.e. on a temporary position) working in biogeochemical modelling funded by the GEOMAR Helmholtz Centre for Ocean Research Kiel. As a modeller, I spend most of my time working behind a desk in front of a computer. It involves mainly research and a tiny bit of teaching and student supervision, and I do a bit of volunteer work for postdoc/parents’ networks on the side. After studying Marine Environmental Science in Oldenburg, Germany I started off as a scientist with a very lucky opportunity for my master’s thesis in Canada, investigating the marine carbon cycle through both research cruises and modelling. Being fascinated by the power of large-scale modelling, I then wanted to develop my modelling skills. So, I did my PhD at GEOMAR focusing on plankton diversity and zooplankton feeding in global biogeochemical models. I continued with a Postdoc at the Technical University of Denmark in a group with a long history and wide experimental experience on zooplankton. The project was part of a newly established Centre of Excellence and as such very well connected to other modelling and experimental projects. After the end of the project after two years, I got a 50% institute-funded fixed-term postdoc position at GEOMAR (later increased to 70%). My current work focuses on the ecological concepts in marine biogeochemical models and assessing the effects of ecology on biogeochemical cycling. Please describe briefly your family commitments. Our first child was born after the first postdoc and is now 5. Our second child was born during my current postdoc position at GEOMAR, and is now 2.5 years old. I spent 7 months on parental leave after the first child and was happy to start with 50% afterwards. 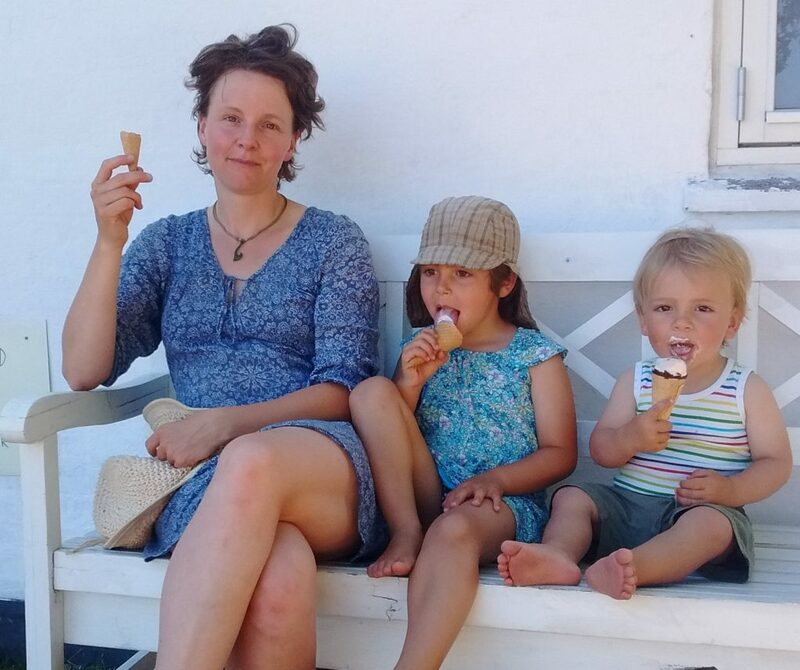 When day-care started after 15 months, my husband returned to working full time in Hamburg and commuting every day. During this time, I was taking over most of tasks connected with kids. When the second child was born, my husband decided to start a new job in Kiel, partly to avoid the difficulties caused by the daily commute. I took 12 months parental leave, as it would have been very difficult for him to take parental leave at the start of a new job.With both kids in day-care and him in Kiel now, we can share family tasks equally. How do you balance your work and family commitments? As a scientist, one can always work more, and work is never finished. But a day has only 24 hours, and cutting down on sleep only works for so many days in a row. I have set work and family times and try not to compromise them unless there is an unavoidable work deadline. Instead, I use my work time as efficiently as I can, with a defined amount of time also for non-output related work (coffee breaks for networking etc.) – anything that then does not get done in my work time, has to get done another day. When it’s time for the family, I want to have a free mind and no lingering work-related tasks. The evening is reserved for household work, partnership and a little bit of the rest of life, hobbies and friends. By actively keeping this balance, I want to stay productive, creative and healthy and not enter the hamster wheel, because being stressed or tired just does not work well with the kids. The temptation to work more – and the bad conscience of seemingly not working enough – is always there, but there are other priorities in my life – especially while the kids are still small – that deserve their time as well. It’s a constant struggle to keep the balance, though. • My husband being supportive. • Exchange about work-life balance with people inside and outside of science. • Getting to know the Danish way of keeping employees happy and productive. • The book “The seven habits of highly effective people” (written by Stephen R. Covey) about priorities, time management, (self) leadership. • Coaching/group mentoring to keep evaluating and reinforcing my priorities. • Taking time for the partnership. • Very supportive and understanding supervisors. • The strong emphasis on competitive rather than collaborative work structures. • Non-flexible work arrangements of my husband. • No family support from grandparents in daily life, as they live too far away. • The low leadership standard in science. What have been the most difficult moments in your career considering family and work-life balance? • Hearing that you cannot pursue a successful career in science if you don’t work notably more than 100%. Since there are very few longer-term positions for academic staff, staying in science seems to mean to become a professor, which in turn seems to mean working a lot. For me this does not work right now if I want to be there for my (small) kids. Now I’m trying to stay in science even with a part-time position and time for the family – let’s see if it works. • Taking over most of the child-care duties for 1.5 years when my husband was commuting and was not allowed to work from home. • Working part-time (50%) and the related lower rate of output and progress when many colleagues are working 120%. What is your experience of sharing family-care: (a) in your everyday life, (b) during field works and (c) secondments? My husband and I have developed a very team-oriented, appreciative organisation and communication style – that helps a lot. We try to not do both drop-off and pick-up on the same day, so that there’s the option to work long either by starting early or by staying late. We alternate days so that neither morning nor afternoon routines become too repetitive. This way, I am looking forward to spending time with the kids rather than worrying about not getting enough work done. As a modeller, I do not have long field trips – sadly or luckily, depending on whether you ask the mom or the scientist. Modest (up to 10-day) meetings away are very doable as long as my husband can provide the extra time needed – that is when flexible work arrangements play a major role. We have almost no family support, and getting our babysitter refunded during such periods would ease the burden considerably. It’s all a question of organisation, but to be fair to my husband and the kids I limit myself to the 2-3 most important meetings a year. Taking the family along would only make sense for stays of more than month and requires a lot of flexibility on my husband’s side of things. Is there anything else that you would like to share on this topic, e.g. advice for others, photos etc.? Kids need their parents when they are small, and that’s not always when we have time for them. Later in life, I would feel very sorry not to have been there for my kids when they needed me – and depending on the kid that is in some phases more than what the default time plan cares for. I can work for the rest of my life. Wouldn’t it be cool if we are encouraged to – and encourage each other – to take the time for the family when it’s needed and not when it fits into the deadlines for the next prestigious proposal or young investigator group? Wouldn’t it be cool if it was normal and supported to go for the big academic career leap when it fits with the family and not before some fixed deadline after the PhD? I work more efficiently since I have kids, and it would make my work life a lot more enjoyable to hear in day-to-day work life that taking time for the family is appreciated and valued in my work environment and that my well-being is important to my employer – as I have experienced the Danish society perceive and treat their work force. This entry was posted in innovations and solutions.